In her youth, Loretta Pettway had many Pettway quiltmaking mentors—including Missouri, Louella, Qunnie, grandmother Prissy, and stepmother Plummer T.—but she has kept to herself artistically throughout her adult life. Her earliest surviving quilts are made of everyday clothing, especially men's work clothes. I didn't like to sew. Didn't want to do it. I had a handicapped brother and I had to struggle. I had a lot of work to do. Feed hogs, work in the field, take care of my handicapped brother. Had to go to the field. Had to walk about fifty miles in the field every day. Get home too tired to do no sewing. My grandmama, Prissy Pettway, told me, "You better make quilts. You going to need them." I said, "I ain't going to need no quilts." But when I got me a house, a raggly old house, then I needed them to keep warm. We only had heat in the living room, and when you go out of that room you need cover. I had to get up about four, five o'clock, and get coal. Make a fire. Them quilts done keep you warm. I helped Grandmama when I was little: thread the needle, cut the pieces, rip the pieces, pick them out for her, put them together. I first pieced a whole quilt when I was about eleven. My grandmama said, "Just piece it up. I got to learn you how to do it." I did one called a "Nine Patch." I wanted to call myself making a pretty one but I didn't know how to line up nothing pretty, so I made me a "Nine Patch." I quilted it, me and my grandmama. I never had a child life. My mother leaved when I was 'round about seven or eight. My father was named Famous Pettway and he lived down here in the country, and he married another woman, Plummer T. We sort of got along. I saw him regular. I was raised for a while by my uncle Tank Pettway and aunt Candis. I grow up with Qunnie and Tank Jr. and them, my first cousins. Then I leaved from over there and went over there with my auntie Missouri Pettway, Arlonzia's mama. I lived there a while. Then I leaved there and lived down there with my grandmama, Prissy. I growed up there then. We were farming and I would go in the field from Monday till Saturday, twelve o'clock. Then Sunday we had to go to church. Every other Sunday I might could get to play with other children on a evening after I did the work chores at home. I get to go to school a little bit, in October and November and December. Then we get ready to knock cotton stalks and break up the land for start the farming over. In the last of December, first of January, we get in the fields then, burning cotton stalks and corn stalks. I had an abusive husband. He was a drinker, he was a gambler, he was a smoker. He had a lot of habits. I didn't have no habits. Couldn't afford them. My husband was real jealous, beat me up if he see me talking to a man. I had seven children. We were farming for a while and I had to work in the fields just the same as when I was little. I had to take the children to the fields. They would sit in the wagon under the tree while we was out in the field working. 'Long until Christmas—September to December—I catch the spur truck and we go on it to pull cotton. We catch that truck about at five o'clock in the morning. When we came back, it be dark. The spur truck was a big old truck with wood walls to hold us in there. 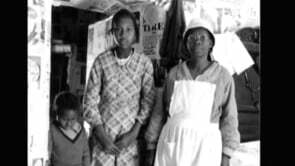 He go up and down the road picking up the mostly young boys and girls that wanted to work the cotton fields. When I was about six we'd go pick blackberries on Saturday till about twelve o'clock, and then we'd get on the ferry and they take us 'cross the river to Camden. We would go and sell them, me and my grandmother. We walked through the neighborhood; she carry them on her head in a pail or a tub, and I would carry a sink bucket full, and sell them by the quarts. I always suffer with bad headaches and could never tote nothing on my head. They know the blackberries be ripe in May, and we go over there; they be waiting. Creation Story explores parallels and intersections in the works of Dial and his fellow Alabamians, the remarkable quilters of Gee’s Bend. 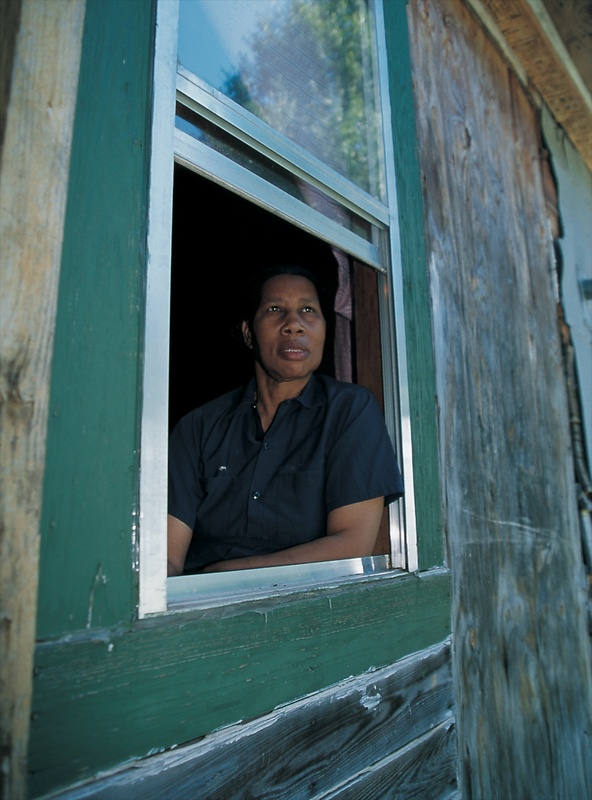 In the tradition of African American cemetery constructions and yard art, these artists harness the tactile properties and symbolic associations of cast-off materials in creating an art of profound beauty and evocative power. 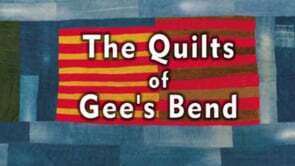 The Quilts of Gee's Bend documentary accompanies the major exhibitions of Gee's Bend quilts. Set in the quiltmaker's homes and yard, and told through the women's voices, this music-filled, 28-minute documentary takes viewers inside the art and fascinating living history of a uniquely American community and art form.